How do you solve a problem like Deutsche Bank AG? 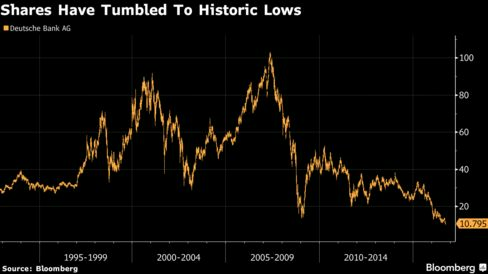 Its share price fell to an all-time low this week amid concerns that the bank may lack the capital to service litigation costs and meet stricter regulatory standards. The catalyst for the recent selloff appears to be Chancellor Angela Merkel’s comments, reported by Focus magazine last week, in which she ruled out state assistance for the bank. Earlier this month Deutsche was hit by a $14 billion U.S. Department of Justice claim to settle the allegedly fraudulent selling and origination of mortgage-backed securities before the financial crisis. Chief Executive Officer John Cryan has said the lender has no intention of paying a figure of that magnitude, and is redoubling efforts to both cut costs and sell assets. On Wednesday, the bank’s shares opened higher for the first time in almost a week after it agreed to sell its U.K. insurance unit Abbey Life Assurance Co. — a move which will boost the bank’s Tier 1 capital ratio by about 10 basis points. Rejecting bearish prognostications about the lender’s financial health, Cryan told Bild in an interview published late on Tuesday that capital “is currently not an issue,” and rejected the notion of German government support. Here, we paint a picture of the bank’s financial health in a dozen charts. The bank’s shares have lost more than half their value this year, and around 20 percent this month alone. That’s been driven in part by investors concerns that it might issue new equity to meet any capital shortfall, a move that would dilute existing shareholdings. 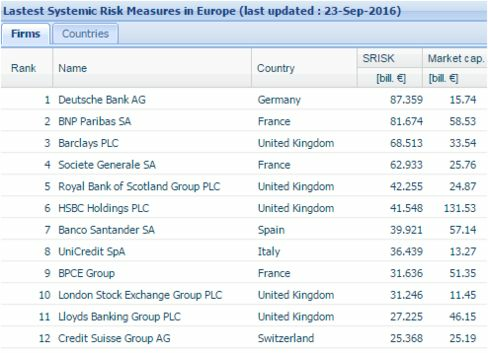 While Cryan has ruled out a capital increase, the bank’s Tier 1 capital ratio, which measures core-equity capital against risk-weighted assets, is lower than major European counterparts’, having been stronger than them as recently as 2014. 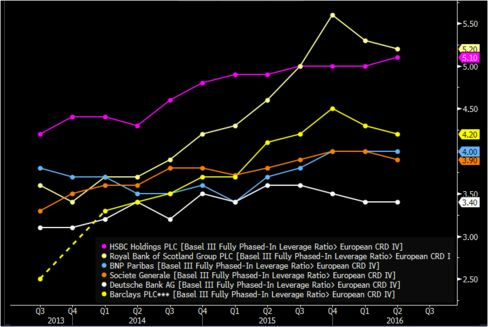 Its leverage ratio also lags its peers, meaning that the bank is more indebted than the industry average. 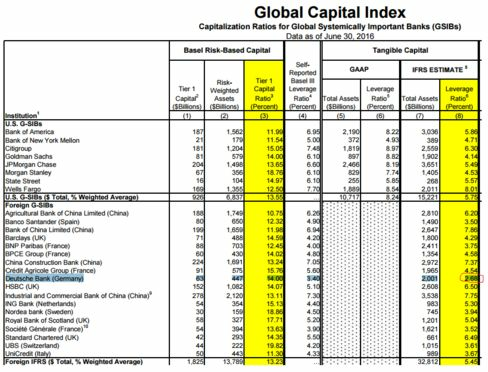 Federal Deposit Insurance Corp. Vice Chairman Thomas Hoenig uses a different measure for leverage which appears to make the bank an even greater outlier relative to major global banks. Sliced this way, Deutsche’s leverage ratio was 2.68 percent as of June 30, around half the average of the eight biggest U.S.-based lenders. Hoenig uses International Financial Reporting Standards, which he reckons incorporate derivatives exposure in a more comprehensive fashion than the standard metric. 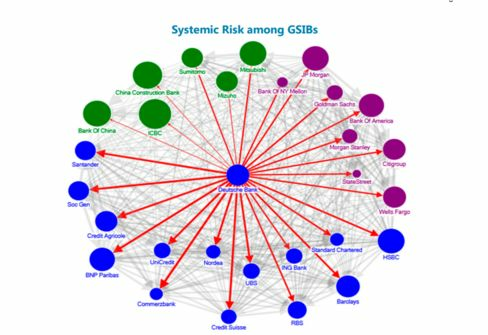 The International Monetary Fund warned in a late June report that Deutsche Bank appears to be “the most important net contributor to systemic risks” among Global Systemically Important Banks, followed by HSBC Holdings Plc and Credit Suisse Group AG. 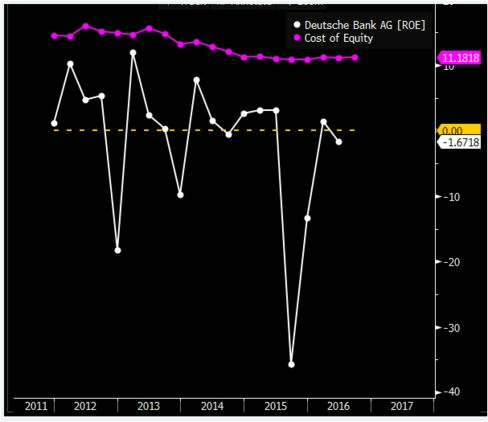 Market-based measures support the view that Deutsche Bank is heavily intertwined with the rest of the global financial system. According to a systemic risk (SRISK) gauge first designed by the Volatility Institute at New York University’s Stern School of Business, the bank would face a capital shortfall of 87.4 billion euros if it were still to fulfill capitalization requirements in the event of a financial crisis — which they define as a 40 percent semi-annualized fall in global stock markets. The SRISK test is a more rigorous and forward-looking measure of assessing banks’ capital adequacy compared with the current supervisory practice, says Diane Pierret, assistant professor at the Center of Risk Management at HEC Lausanne. 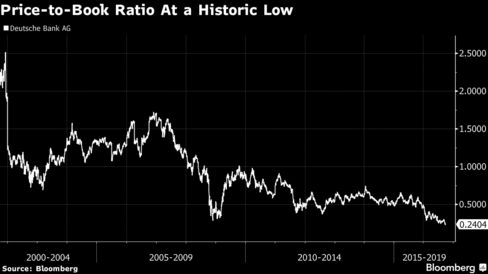 Meanwhile the fact Deutsche Bank’s price-to-book ratio is “far below one” — and hovering near an all-time low — suggests that the market takes a dim view of the lender’s financial health, she says. The cost of credit default swaps that protect against the risk that the bank defaults on its subordinated debt shot up above 520 basis points at one point on Tuesday reflecting a spike in investor concern. 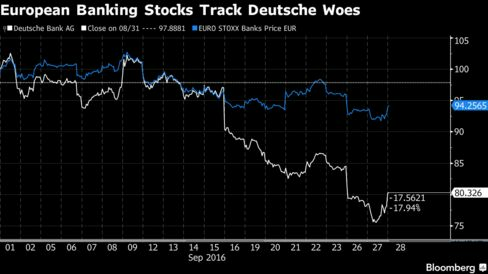 The turmoil is also roiling shares of banks across Europe. Market instruments such as contingent convertible bonds, known as CoCos, will be among the first to absorb losses if the bank is unable to meet capital ratios according to supervisor-determined levels. 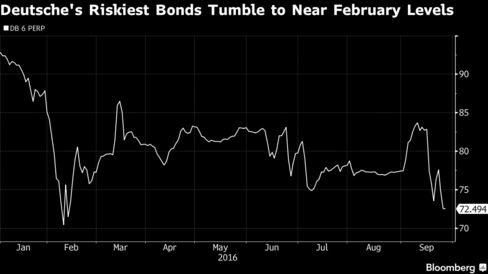 Yields on the bank’s CoCo bonds have climbed to their highest levels since a February rout, which was triggered by analysts’ warnings that the bank might skip coupon payments on these securities if operating results were to disappoint. “The final settlement value of Deutsche’s RMBS case is really anybody’s guess but clearly the market expects a figure in the mid-high single-digit range,” says Arjun Bowry, bank analyst at Bloomberg Intelligence, in reference to the residential mortgage-backed security allegations. A DOJ fine of more than $6 billion could trigger coupon deferrals on CoCo bonds, wrote credit analysts led by Miguel Hernandez at BNP Paribas SA, in a report on Tuesday, placing the odds of that happening at 50 percent. 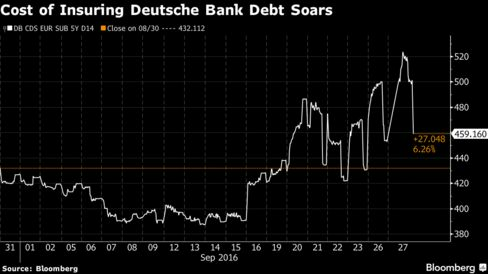 Deutsche said last month that it is seeking to beef up its leverage ratio to 5 percent by 2020. 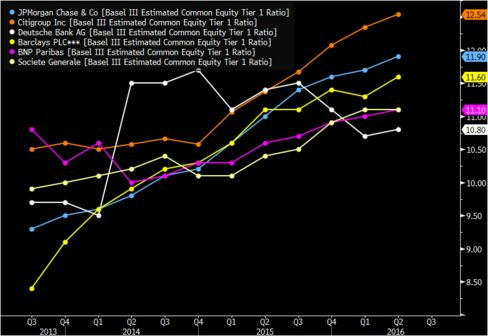 But the bank faces an uphill battle: return-on-equity is expected to be negative this year, according to market estimates, even while the cost-of-equity is flatlining. As well as fire-fighting the current market maelstrom, Cryan is in the throes of a complex program to shift the focus of the institution away from investment banking, an area that’s struggling to drive growth in the new regulatory climate. The bank has been hit by an annual drop in its fixed-income trading revenues that averaged 6 percent between 2012 and 2015. Deutsche Bank shares were up 2.1 percent on Wednesday.